Tamaño desta vista previa en PNG do ficheiro en formato SVG: 800 × 400 píxeles. Outras resolucións: 320 × 160 píxeles | 640 × 320 píxeles | 1.024 × 512 píxeles | 1.280 × 640 píxeles | 1.200 × 600 píxeles. English: This file represents the very first professional vectorization of the Flag of the Republic of Serbian Krajina. This Flag was in use from 1991 to 1995, during the Yugoslav wars. Овај документ представља прву професионалну векторизацију заставе Републике Српске Крајине. Ова застава је коришћена од 1991. до 1995. године, током рата на простору бивше Југославије. Orixe This file is the result of collaboration between the authors (listed below). It is the work of those authors alone, and no other persons participated in the creation or development of this work. This Flag, and the State it once represented, no longer exist, except in the hearts and minds of those that remember them. 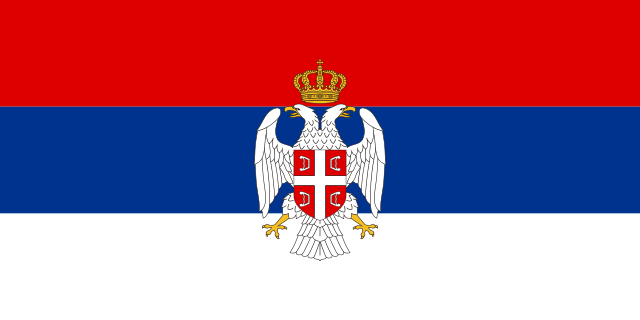 4 de marzo de 2011 ás 21:01 562 × 281 (334 kB) Orlovi Gvozda Exact reproduction of the alternative flag used by the Republic of Serbian Krajina from 1992 to 1995, as described on the website Flags of the World.